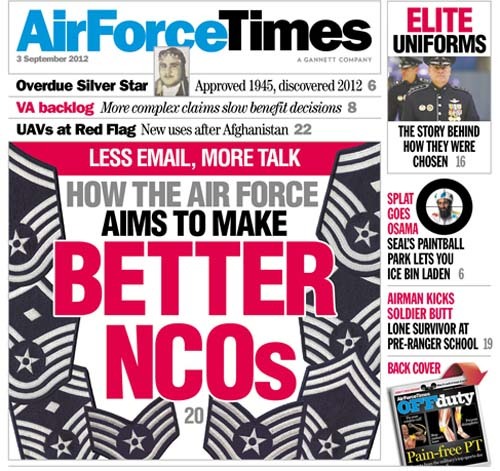 The Air Force wants noncommissioned officers to stop relying so much on email and spend more time talking to the airmen they lead. This is part of a three-year plan to enroll NCOs in leadership schools, which will push them to get to know the people they are in charge of. In other news, the Air Force has issued new guidance on how to use social media so your tweets can be LOL. Otherwise, you might say something inappropriate or unprofessional, and you will be SOL. Meanwhile, in one of his last acts as chief of staff, Gen. Norton Schwartz signed off on an extensive instruction covering the Air Force environment, conduct and appearance – including uniforms and physical fitness. Many airmen criticized the instruction as being unnecessary, claiming it merely duplicates the same guidance issued elsewhere. And if you don’t like the ceremonial uniforms that Chief of Staff Gen, Mark Welsh III and Chief of Staff of the Air Force James Roy wear at daytime formal events, you’ll have to get over it. The uniform is the official attire for both men, so you will be seeing it again.